In this topic we will cover up the conversion from ER to Relational Model and the SQL implementation. Conversion from ER model to another step which is more advanced logically is crucial in Database Design. And this advanced logical step is called Relational Schema. Let's start with the conversions. The relationship between Movie and Actors transforms in a new relationship because the relationship between them is many to many and at MovieID we discern the NULL value. 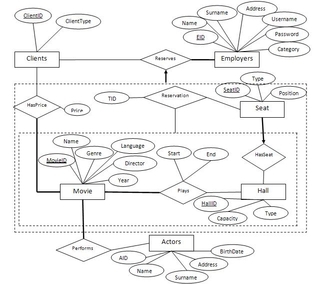 where MovieID and AID are both Primary Key and Foreign Keys at the Performs Relationship. where MovieID and ClientID are both primary and foreign keys. Hall is in relationship with the Seat entity where seats have a must participation in the relationship so this transformation happens by incorporating the relationship into the Seat entity and discerning the NULL value. The Movie, Hall and Seat entities participate in a relationship and the relationship is many to many so we are obliged to create a new relationship for Plays. The primary keys of Movie and Hall entities become foreign keys at the Plays relationship and meantime Primary Keys. Just because at the Cinema we have prices for static tickets we create another entity Ticket with ticket number and the price where the ticket number is Primary Key. Now, since we mapped the ER diagrams into the relational model we start creating the actual SQL implementation. The implementation was done on MSSQL, but this doesn't matter much since MSSQL uses SQL standard and it has only minimal differences from other DBMS. 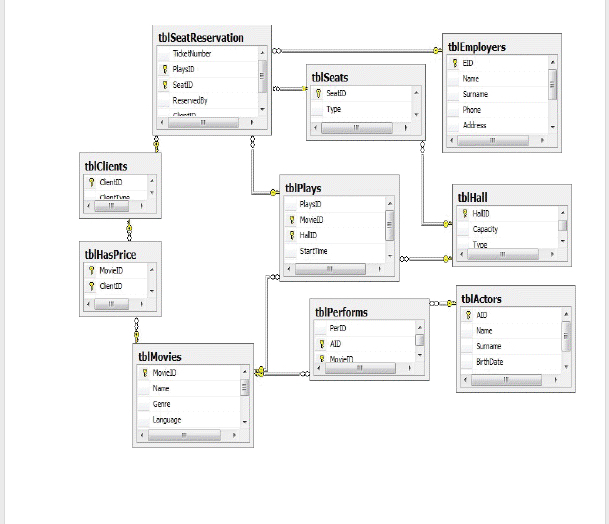 And, finally this is the snapshot of the Database Diagrams implemented in the MSSQL 2008. Interesting although I don't know much about the topic but the article was so interesting that it indulged me in reading.